Next time we decide to drive 5 hours down to Norfolk on a Bank Holiday, please just tell me "NO!" - this was our first experience of driving down to see my parents during a Bank Holiday and the traffic was awful. Being stuck in a boiling hot car for hours in endless traffic jams is not the way I want to spend the extended weekend! 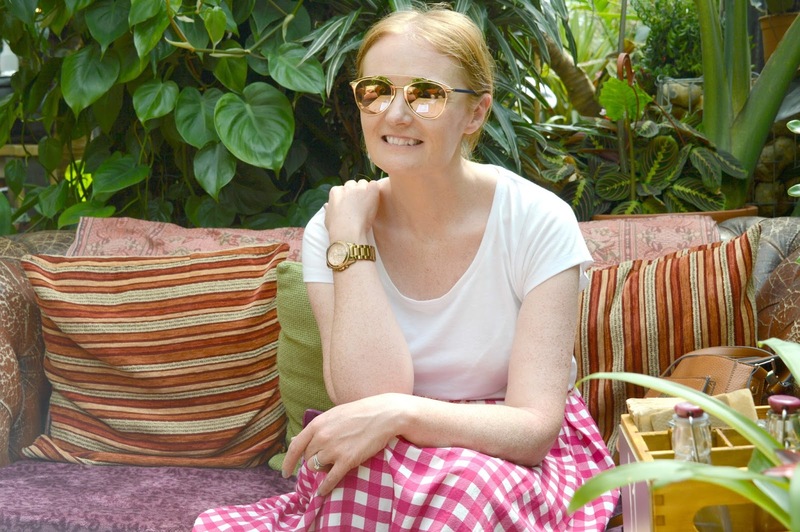 We got there in the end though and had a beautiful weekend in the sunshine back in my home county, I thought you might like to see what we got up to! Anyone fancy a short break from the North East and a jaunt down to the beautiful flat countryside of Norfolk? Let's do it! We were very lucky that our trip back home coincided with the hottest weekend of the year so, as you can imagine, I went in to full planning mode and we arrived at my parent's house armed with walking maps, cameras and an itinerary. Spare a moment for poor old Simon who just wanted to chill out with a nice cold can of Cider in the garden! 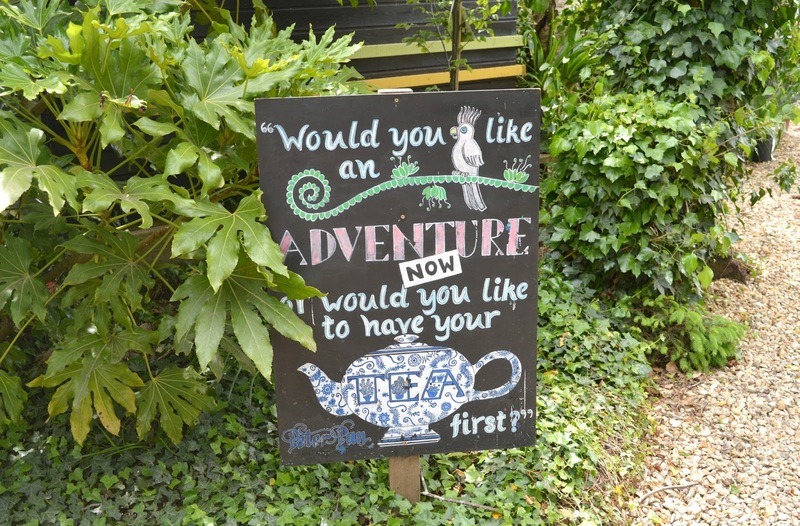 Sunday was declared our day of Norfolk adventure and I was determined to tick a few things off my Norfolk wish list starting with a trip to Urban Jungle, a garden centre with a difference in Costessey. 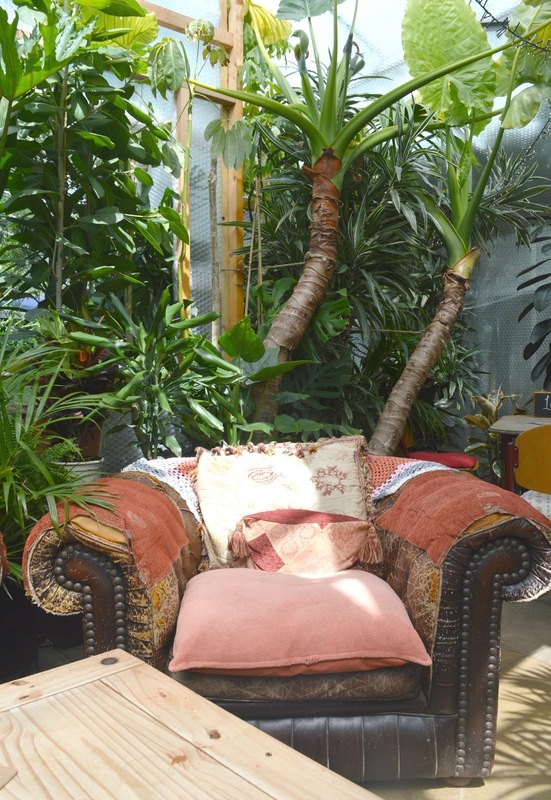 Selling exotic and unusual plants in the most beautiful location it constantly pops up on my Instagram feed. I can't pretend to you that we were there for the plants, you all know me far too well and must know by now that if we're anywhere near a garden centre it tends to involve our bellies! 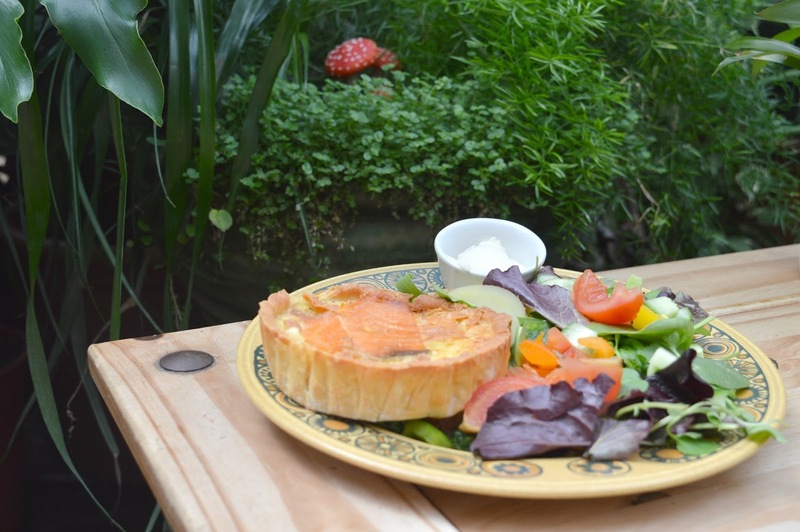 Urban Jungle is home to Café Jungle, a tropical glass house selling delicious gluten free food from a packed counter of goodies. I managed to resit the most delicious looking cakes (only because I knew that I'd want an ice-cream later in the afternoon!) and instead we decided on a healthy lunch of salad and homemade quiche. Served to us on our gorgeous table amongst the plants, I really did feel like I was eating in a jungle! What a treat! I'm so sad that this lovely place is all the way down in Norfolk and not in the North East. Something tells me I'll be wanting to visit each time we head south! With full bellies we took our adventure up towards the North Norfolk Coast, and wanting to utilise our National Trust membership, headed to Sheringham Park, somewhere that I hadn't been for many years. 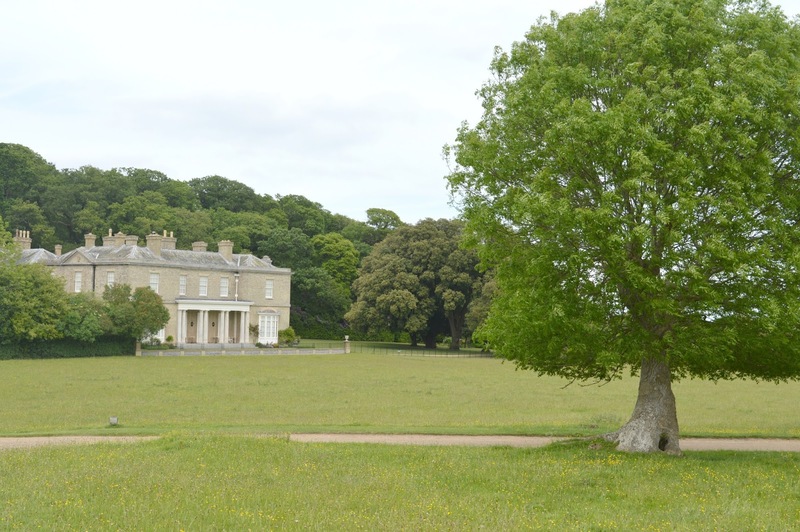 Sheringham Park is a huge park with the most beautiful coastal and woodland walks, it's free entry to everyone and if you're a National Trust member you can also park for free. I couldn't wait to show Simon round somewhere I spent so much time as a youngster. Every path was lined with the most beautiful multi-coloured trees. Reds, pinks, oranges and whites, I've never seen such a pretty floral display and I eagerly explored every path, amazed that round every corner there were even more impressive arrangements. Battling with the Bank Holiday tourists to take photographs was more than a little tricky and this flower loving amateur photographer was getting a little frustrated at times. 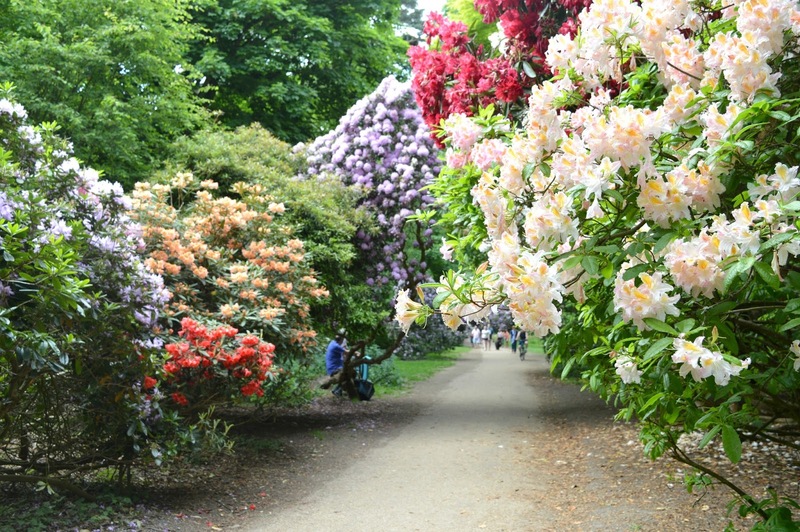 If you're planning a visit yourself going early on a week day would probably secure you some fantastic alone time with the floweres, something I wish we'd realised. Seeing as Norfolk is well known for being as flat as a pancake, I was pretty surprised at how hilly Sheringham Park was, I didn't remember it being such a climb, although maybe it's just that my legs were fitter and stronger in my youth. 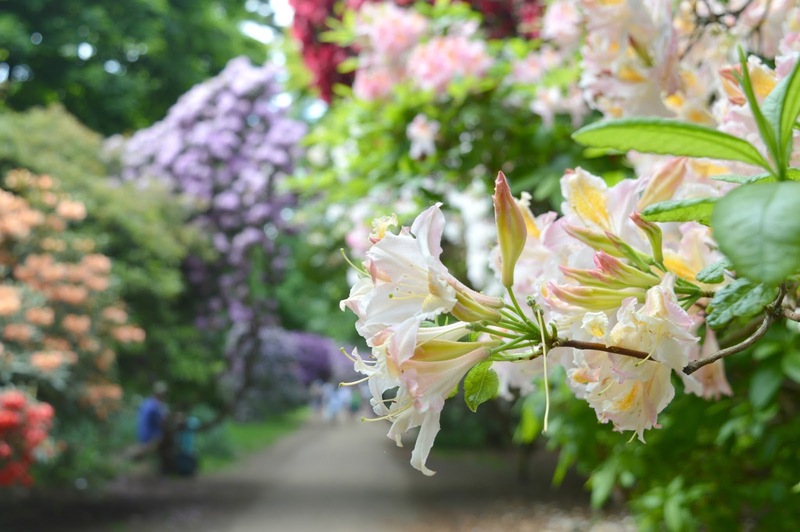 Climbing to the Gazebo is the ultimate treat at the Park and once your legs have stopped burning from all of the steps you are blessed with the most fantastic views of the Norfolk countryside. Moments like this give me goosebumps and make me so thankful that I spent my childhood in such a beautiful part of the country. We were very lucky as we hadn't been at the top for long before we heard a familiar "TOOT" in the distance. The steam train was coming and we were in a prime position for some train spotting. 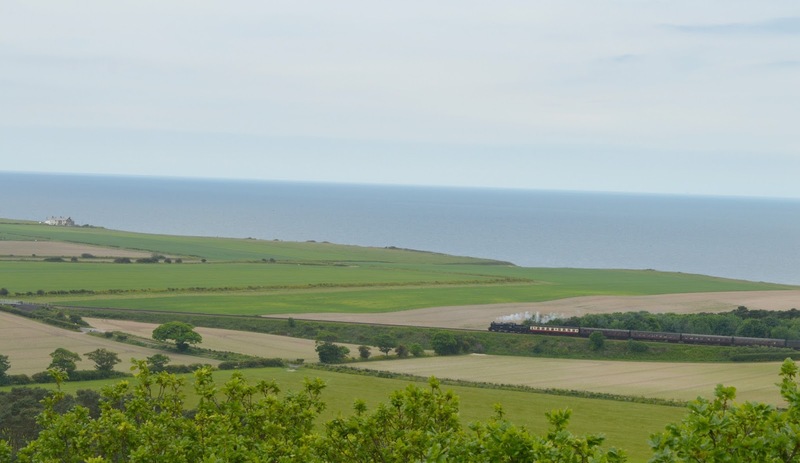 The North Norfolk Railway runs between the beautiful towns of Holt and Sheringham and if you're lucky you can get a perfect view of the train from the Gazebo. Heaven! 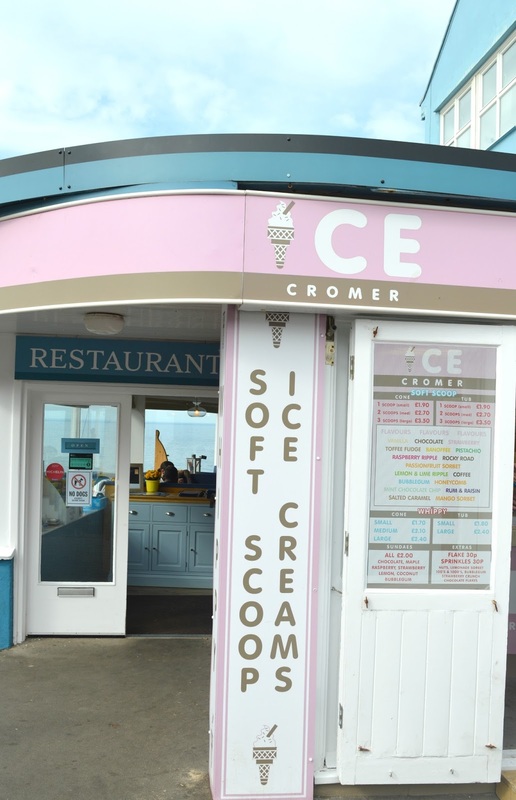 Resisting the temptation of the National Trust café we ended our day with a trip to my favourite North Norfolk seaside town, Cromer. A few miles from where I grew up, as soon as I learnt to drive I'd take myself here on Summer's evenings for a little wander along the seafront. 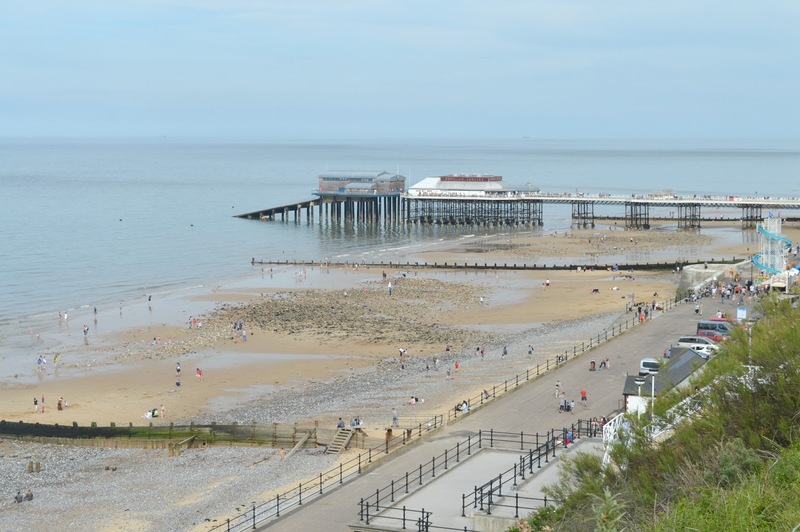 There are so few traditional seaside towns left in Britain which makes Cromer a pretty special place. 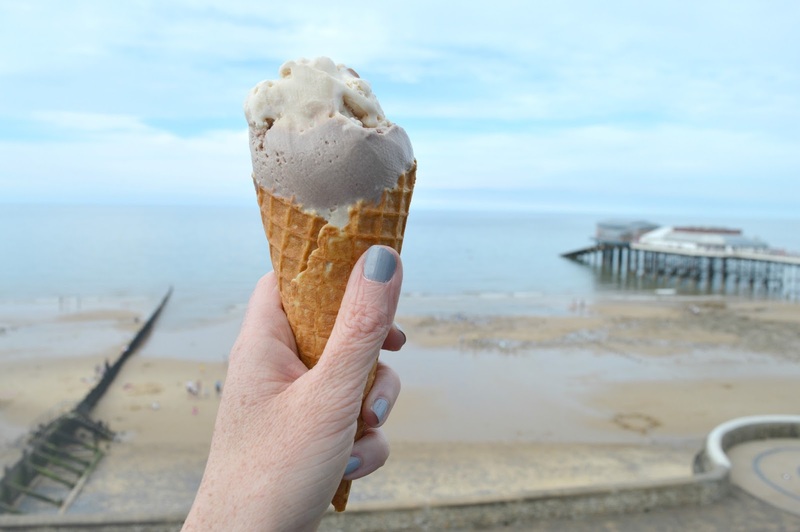 Of course, it's obligatory to stop for a cone at Ice Cromer when you're at the seaside, especially when the sun is out and the temperatures are soaring. The perfect excuse to go greedy and get a sugar cone! Simon and I have become obsessed with these recently, for some reason standard cones just don't do it for us anymore. We like our ice-creams huge! I had three scoops (oh the shame!) and went for a heavenly mixture of banoffee, toffee and chocolate flavours. Living the dream! Our trip to Norfolk was over far too soon and as we made our way back home to the North East I have to say I felt a little sad to be saying goodbye. It's been 10 years since I last lived there, yet sometimes I feel a slight pang of sadness when I leave it all behind. Thank God I now live in an equally beautiful part of the country! Let me know if you've ever made it to Norfolk and what your favourite parts are. Yaaaay Norfolk, and especially that you went to Urban Jungle! 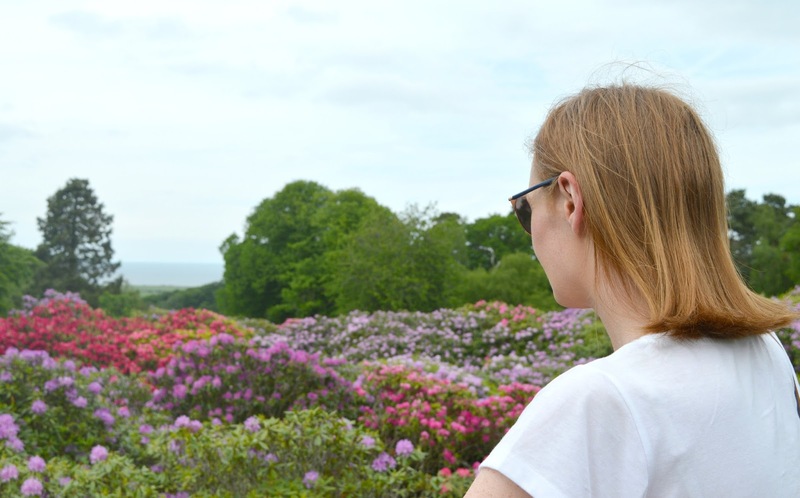 I absolutely love Sheringham Park although I dont think I've ever seen the flowers as amazing as they are in these photos, jealous! Bank holidays are definitely made to stay home, or go out on your bike, not travel ANYWHERE. Haha! Such lovely palces you visited. I haven't been to Norfolk in many many many years, but I'd love to go back.